This 'alien' is really painted bread and chicken! 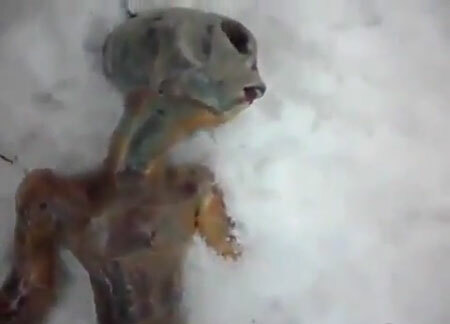 A few days ago, a Youtube video purportedly showing a dead space alien in Siberia went viral, getting over 3.5 million hits in less than 3 days before the video was revealed to be a hoax. In short, the space alien turned out to be painted chicken and bread. Now, story over, this video will now go into the historical vault of alien hoaxes, some interesting, some far-fetched, others very convincing, and some all of the above. Now for some of the most famous alien hoaxes in history. A scene ran in the New York Sun that supposedly depicts life onthe Moon. 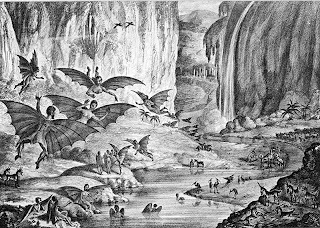 In August, 1835, a series of sensational claims of life on the Moon came to the world via the New York Sun newspaper. In the article, the Sun announced that John Herschel (son of William Herschel) had invented a new, giant telescope that was so powerful that he could see life on the lunar surface. The first article in the series dealt with the 24 foot diameter telescope that was also armed with a magnifying lens that gave it its previously unheard of power. In this article, there were hints that, should there be life on the Moon, Herschel would find it. 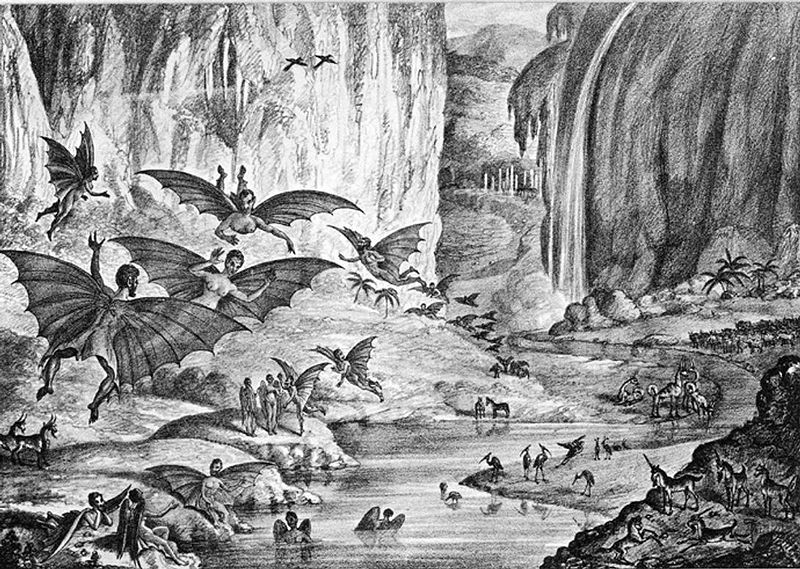 The following days dealt with Herschel's discoveries of plant and animal life on the Moon, which included human-like creatures. Next came claims of architecture, signifying complex lunar society. To some, this all seemed too incredible to be true, which is exactly what it was, the hoax being unmasked when newspapers in Europe (where the story is supposed to have originated), failed to corroborate the Sun's claims. 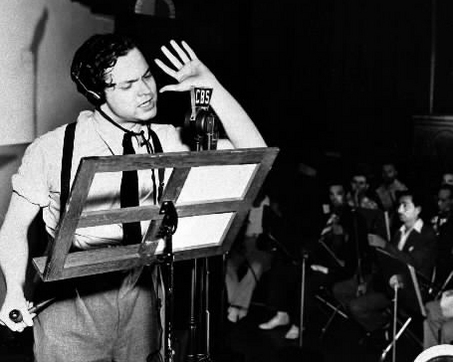 Orson Welles in his radio studio. On Halloween Eve, 1938, many people were convinced that the end of the world was at hand. Why? Radio broadcasts were claiming that Martians had landed in New Jersey and were using heat rays and gas to kill all the humans they came into contact with. Everything seemed normal that night until the regularly-scheduled broadcast was interrupted by a special news bulletin, claiming that a strange meteor had fallen to Earth in New Jersey. After that, the music resumed, only to be interrupted again with further developments, which included how the meteorite was actually a space ship containing killer Martians. Needless to say, mass panic ensued despite several statements during the broadcast saying that everything was a dramatization. The following day, the man behind the play, a young Orson Welles, held a press conference where he apologized for any panic that his show caused the previous night, stating that he was profoundly “embarrassed” over the fiasco. Yes, while Welles may have been embarrassed, he probably wasn't half as embarrassed as all of those people who ran panic-stricken into the streets and to their cars in order to make an escape from what they thought was certain death. Despite long being known as a fake, Aztec's hoaxed UFO crash is still making money. In 1947, the American public started seeing strange objects in the sky en-mass. After the reported flying saucer crash at Roswell, NM in July, 1947, saucer mania gripped the jittery nation. 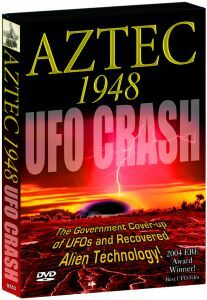 Then, in March, 1948, two men, Silas Newton and Leo Gebauer, claimed to be in possession of wreckage from a flying saucer that crashed near the town of Aztec, NM. However, not being content making up stories about the flying saucer itself, the pair tried to cash in on their discovery by selling the wreckage. Unfortunately, this proved the pair's undoing. When some buyers closely examined the wreckage, they found it to be of very Earthly origin. One of the buyers then reported the pair to the FBI. In 1953, both men were convicted of fraud. In an ironic twist, seeing how the residents of Roswell capitalized on their supposed UFO crash, Aztec started holding similar, money-making UFO gatherings. Well, at least this is legal profit as stupidity is not a crime! 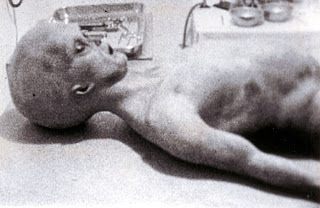 This is not a Roswell crash victim, but a dummy. Perhaps the most sensational alien hoax of them all, the alien autopsy video came at the right time at the hands of the right people. In the mid 1990s with the millennium right around the corner, general interest in the paranormal was on the rise. As for the video itself, it was 'discovered' by Ray Santilli, a music producer who knew a thing or two about putting a marketing campaign together. First announcing the find in may, Santilli carefully fed the press tantalizing tidbits of information in a lead-up to the film's airing on national TV in August in a special titled “Alien Autopsy: Fact or Fiction”. The special took top ratings in its time slot in its original and subsequent airings. However, experts were divided over authenticity of the film in a debate that would rage for over a decade. Ironically, the hoax was exposed after Santilli himself produced a documentary about the alien autopsy footage, obviously trying to milk the story for all it was worth. In a 2006 interview, Santilli admitted that the footage aired on TV was a fake, a recreation of real footage that had deteriorated too much to be aired on TV. Obviously, this admission destroyed any remaining belief in the autopsy film's authenticity, which was marketed as “100% authentic” a decade before. Oh yes, the real footage has never come to light, either. 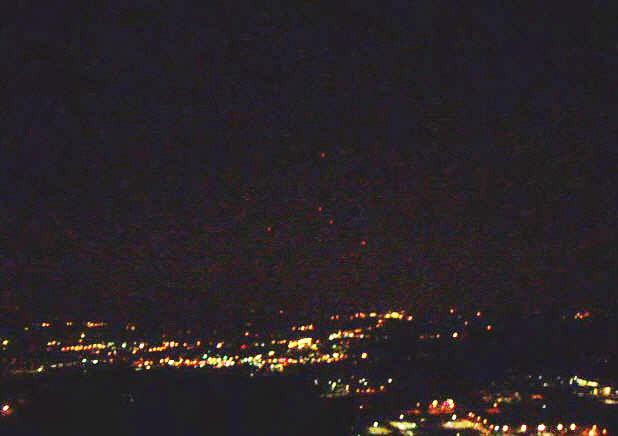 The Morristown Lights, which were really flares tied to balloons. In January and February, 2009 reports of strange lights over Morris County, NJ started to flood local police departments. After reviewing reports, the police wee skeptical; but UFO believers were adamant that the lights were real and, assisted by a lack of skepticism in the media, the story quickly took off and went national, even being featured on “UFO Hunters,” a History Channel program. A few months later, on April Fool's Day, several men came forward saying that they had hoaxed the lights by tying flares to helium balloons. Proof of the duplicity? Photos of the perpetrators in the act. The motive: to show how easily a gullible public can be led to believe something that's not real. Well guys, by and large, you succeeded.